Destroyed homes in Kajuru, Kaduna. The Command Public Relations Officer, Yakubu Sabo, a deputy superintendent of police, confirmed this to the News Agency of Nigeria (NAN) on Thursday in Kaduna. 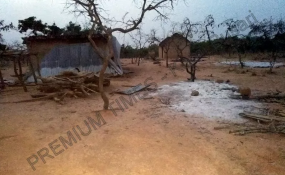 Mr Sabo disclosed that the police received information on March 12 at about 11:45am that a group of armed bandits entered Jan Ruwa Village of Birnin Gawri LGA and rustled many cows. "And that a team of vigilante group of the village who were returning from a function in Zamfara State, got the information mobilised and pursued the criminals into the deep forest, engaged the bandits in serious gun duel, as a result of which some of the vigilante men lost their lives." Mr Sabo said a combine team of policemen mobile force and conventional police and vigilante mobilised to the area for search and rescue mission. "This brings the total number of vigilante men who died to 17," he disclosed. The spokesperson said the Commissioner of Police, Ahmad Abdurrahaman, condemned the killing of those patriots and vowed to apprehend the perpetrators to face the consequences of their action. "He condoled the families of these gallant citizens who volunteered to assist security agencies in the protection of life and property of the citizenry. "The CP assure members of the public that, the command has sent detectives to the area and working hand in hand with other security agencies to ensure timely arrest of the culprits."